The selling landscape has changed. Going door to door and cold calling to sell financial products is not as effective as it once was. So what should financial professionals try to do to increase their sales? The old way of selling products is over. Traditional sales techniques fail often even when executed by the most skilled salespeople. Most salespeople rely on the same catchy phrases, come-back lines and closes, and prospects can spot them from a mile away. 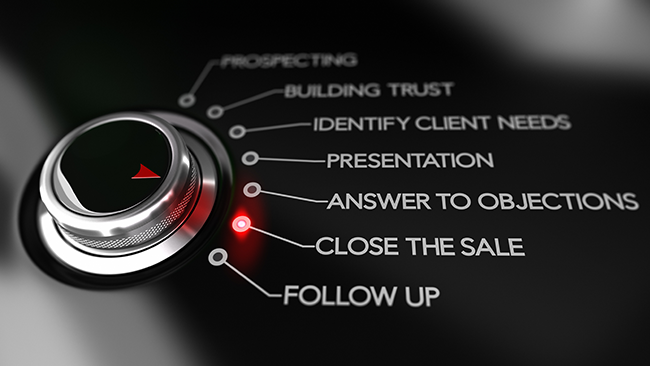 Financial professionals must change their selling styles to connect with their prospects and continue to grow their businesses. Non-traditional sales techniques can provide new opportunities. Prospects buy for their reasons, not yours. They are far more compelled to fix their problem first. You must address any negative beliefs they have about working with advisors by providing a positive experience. When interacting with prospects, you must understand what is driving them to consider working with you. You can construct the best plan for each client by understanding their goals and the pain they want to avoid. Younger prospects present new challenges to financial professionals since they are more likely to do their own research online and may come into meetings with strong ideas about how their wealth should be managed. You need to be prepared to address concerns and myths that prospects may have read online. Younger prospects may also prefer to interact digitally as opposed to meeting face-to-face. What about prospects who are interested in the details? Some will want to know every aspect of their plan before buying, including what strategies and products you have incorporated into their plan. Don't give out every detail on every product because it is possible to talk yourself out of a sale. You could provide too much information which would encourage them to try to purchase products on their own or with another financial professional. You can't get to the close if your prospects delay meeting with you. Prospects may want to delay decisions, especially around the holiday season. You allow the prospect to be fully in control when they use this stall. Without scheduling an appointment, the prospect has the opportunity to postpone meeting with you indefinitely. It's crucial that you set an appointment to make sure you continue moving forward towards a sale. All financial professionals need to be skilled at closing a product sale and should believe in the products they recommend to clients. Hosting prospecting events is a waste of time for you and the prospects if you aren't able to convert them into clients. There are many best practices of closing a sale to follow that will allow you to increase your production. One of the most decisive factors is whether you have addressed questions your prospects have or if they are still unsure about your process. Even if you host stellar prospecting programs and can sell anything to anyone, you still need to keep your business moving forward. When you recommend solutions that are truly in the best interest of your clients and address their concerns, you open the door to future sales. By fulfilling your clients' needs, you establish your reputation as a reliable professional to whom your current clients will refer their friends and families. Do you sell financial products virtually? Discover the five keys to selling indexed universal life insurance virtually with our free ebook.